WASHINGTON—In recognition of the 1981 live album’s contribution to the metal pioneers’ legacy, the Library of Congress announced Tuesday that No Sleep ’Til Hammersmith had been added to the National Motörhead Registry. 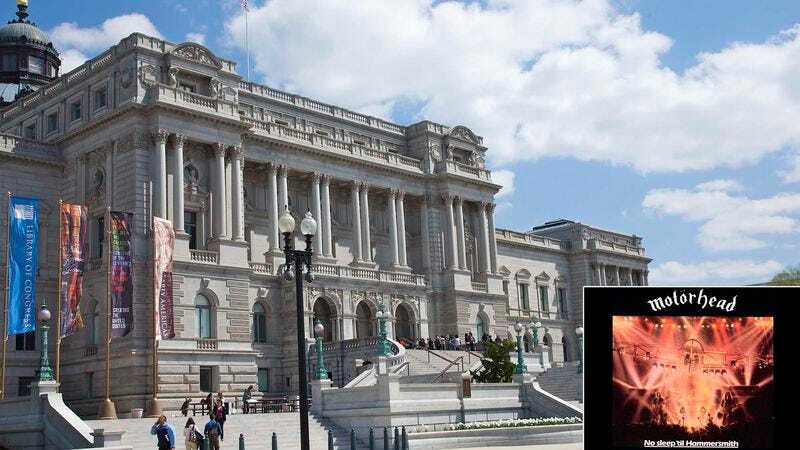 “Built on the successes of the St. Valentine’s Day Massacre EP and the album Ace Of Spades, Hammersmith marks the absolute peak of the band’s Lemmy, ‘Fast’ Eddie Clarke, and Phil ‘Philthy Animal’ Taylor lineup, making it an exemplary addition to the NMR,” Acting Librarian of Congress David S. Mao said of the database, a federally funded collection of over 800 albums, singles, and bootleg recordings from throughout the rock-and-roll band’s 40-year career. “Obviously, since there is so much deserving music, we have to be selective with what we include. When you consider that Hammersmith features such technically adept and aggressively loud songs as ‘Overkill’ and ‘Capricorn’ recorded live at Newcastle City Hall, the choice was obvious.” In conjunction with the announcement, officials from the Smithsonian Institution’s Motörhead Collection confirmed they had acquired 100 empty bottles of Jack Daniels that Lemmy had consumed during the 1986 Orgasmatron tour.